Hello again everybody! Ryechu here, and I did the Windows 10 and Steam betatesting for A Kiss For The Petals – Remembering How We Met! So you may notice that this title is… a lot different from my previous testing gig. Like, a lot a lot. For those who aren’t aware, I am a HUGE fan of the Sono Hanabira series, and when I heard that Mangagamer was localizing even one of the titles, I knew that I needed to work on this. I REALLY hope you enjoy this touching love story between what could very well be the cutest couple to ever grace St. Michael’s All-Girls School. 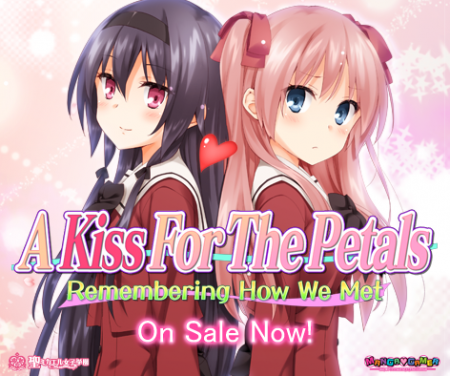 A Kiss for the Petals is actually a rather popular yuri nukige series released by Fuguriya starting in 2006. 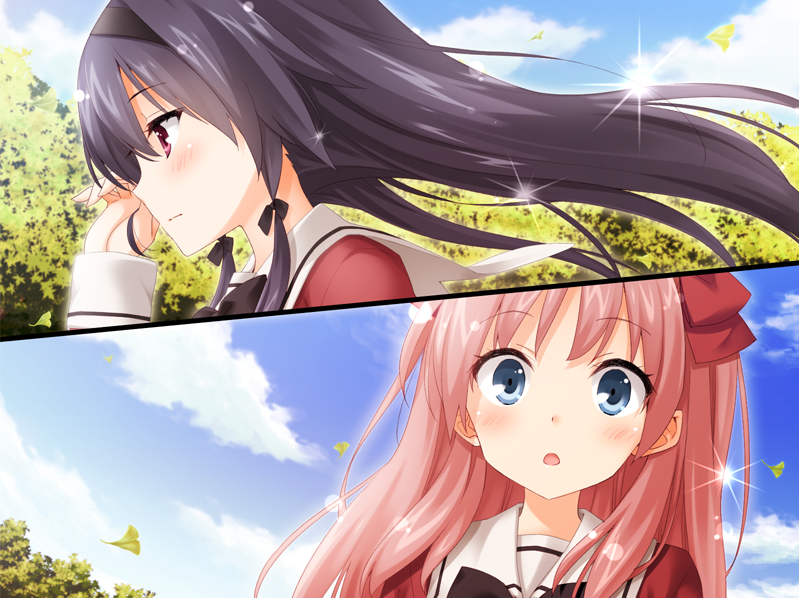 Many consider it to be the best yuri VN series out on the market today, and there’s a damn good reason for that, too. Each of the, count ‘em, nineteen games is extremely popular and the production values are second to none. The art is phenomenal, the music is memorable, and the characters are equally memorable, not to mention insanely cute. This specific title, Remembering How We Met, was originally released for Android and iOS, and explores how the relationship between Azumi Risa and Ayase Miya began. 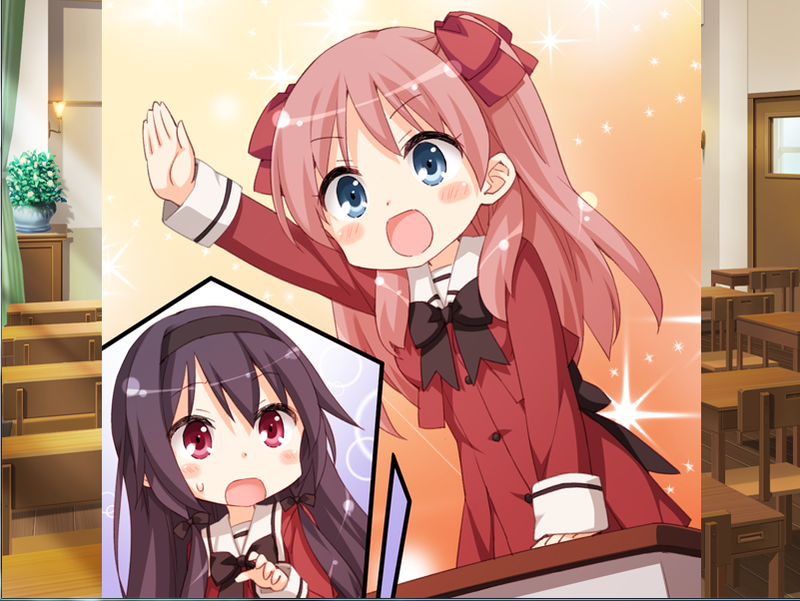 Risa, our pink-haired protagonist, is a very stubborn girl who has natural leadership qualities, and insists on having a perfect attendance record. Ayase, on the other hand, is the polar opposite in everything except stubbornness – though hers resides from the fact that she’s a genius and doesn’t have to go to class at all. The story evolves from that one key point, and through a number of twists and turns, oftentimes comical dialogue, and just enough drama to make you want to keep reading, Remembering How We Met is a fantastic addition to the series, and I can’t wait to see what everybody thinks about it! I had a lot of fun working on this project, and I really look forward to helping bring out more amazing titles with Mangagamer!